Where can you get a discount hot tub? You can find one at a nearby box store such as Home Depot, or you can shop online. By buying online instead of a retail store, you cutout sales people that may work on commission in the case you have an idea of what type of spa you are interested in. There is no substitution for shopping around and becoming familiar with the spa manufacturing process in order to differentiate fact from fiction. The spa industry is littered with recently hired salespeople whose primary motivation is to make a sales commission rather than offer the customer a solution for their individual needs. Buying a discount hot tub can involve buying a new hot tub at a discounted price or a used hot tub on Ebay, Kijiji, Craigslist or other online classified ad source. Beware of buying a hot tub that is much older than 5 years old as there could be issues with calcium carbonate deposits or other unsanitary deposits within the plumbing lines, calcium carbonate buildup covering the heater coil and hence making heating more expensive, or a number of other issues that can affect older spas. If you find a used spa in good condition at a reasonable price, rest assured that most parts are available from online parts houses such as Canada’s The Hot Tub Superstore and Spa Sauna Direct, Iowa. Getting a discount hot tub may just mean negotiating a great deal from a local hot tub retailer or manufacturer. Beware of 50% off sales as they can sometimes be based on a fictitious retail price. The best way to avoid the many games that are played by unscrupulous web operators or fast talking retail showroom salespeople, or worse yet the in-house visitor that is a cross between the old encylopedia salesman and the tupperware lady. Avoid these high pressure sales tactics by comfortably dealing directly with a manufacturer of high quality spas usually through their online store. When it comes time to buying a spa on the internet, you will want to make sure you are being supported by the factory. Doing business on the internet does not mean dealing with unknown or untrusted sources as there are several high quality manufacturers who have embraced the web and passed savings onto savvy consumers. There is a wealth of information online, but many of us do not have the time to become hot tub experts in order to seperate the wheat from the chaffe, so a trusted online source that can “cut to the chase” and give us the “lowdown” or “skinny” on the subject is highly appreciated. 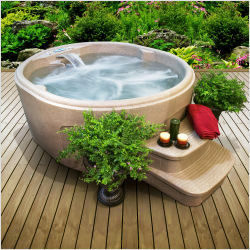 Discount Hot Tub Spas offers information for hot tub buyers that is direct and to the point. Send us an email with any hot tub buying question, and we will answer you within one business day. Happy hot tub shopping, and start relaxing your muscles soon after completing your online research!